You’ve done it, I’ve done it, and no doubt every dancer has done it: taken a job without pay whether it is for personal experience or as a favour to someone. Helping people out and gaining experience is all well and good but the fact that there are far more dancers than jobs in Australia means that we have allowed ourselves to accept whatever work comes our way, whether or not that work comes with a salary, and it has created a dangerous precedent. The expectation from agents and employers now is that dancers don’t need to be paid and as a result, the number of paid jobs has become frighteningly scarce. Following on from Dance Informa’s article Dancers Without Wages from September 2012, Paul Malek and the Dance Chat team have reignited the debate in the wake of Kylie Minogue’s representatives asking dancers to appear in Kylie’s new film clip for free. The clip in question is for the Pharrell Williams produced track I was Gonna Cancel and it was choreographed by Sydney Dance Company Artistic Director Rafael Bonachela. Yep, even multimillion-dollar recording artists seek to exploit the years of hard work and training that dancers have endured, without spending a penny. Social media has been inundated with the hash tag #paythedancers, and dancers as well as non dancers have changed their Facebook profile picture to reflect their support for the #paythedancers movement. Thankfully, after the uproar and social media flurry, Actors Equity Australia announced that Warner Music Australia has agreed to pay the correct legal rates to all dancers involved in the music video shoot, The Age reported on Thursday. “I understand things have been resolved now so it’s great to know that people can have a voice, people can speak and mistakes can be resolved. That’s a very positive thing,” Rafael Bonachela told The Age. I chatted with Paul Malek following his appearance on Channel Ten’s The Project to get his thoughts on the issue. A lot of people are saying that dancers should take unpaid jobs for the experience. It is “normal” practice for a new professional (actor, dancer, singer, etc.) to gain experience by volunteering their time. What are your thoughts on this? 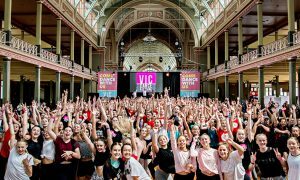 As there appears to be an expectation that many dancers will work for free and jobs are so scarce in Australia, do you think it is reasonable for dancers to fear that if they say no to unpaid jobs that agents will stop offering them work? What can we do to ensure that dancers are paid?